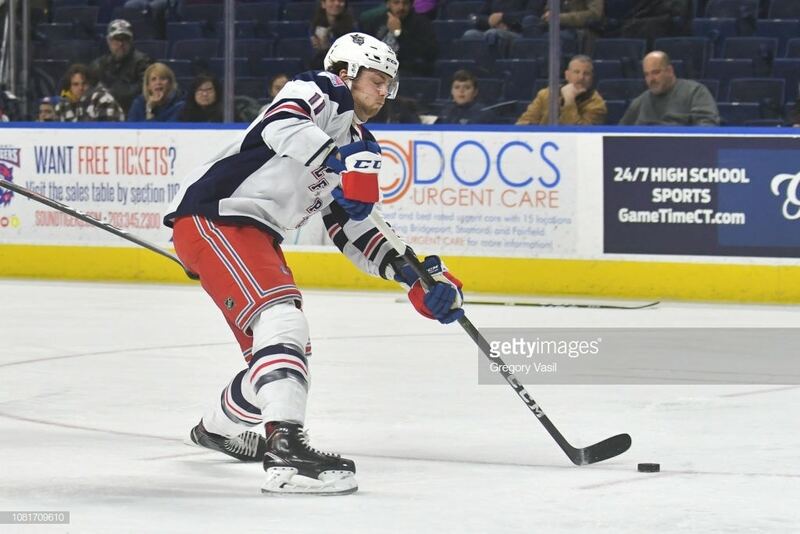 Utica, NY, March 16, 2019 – Ryan Gropp scored twice, and Adam Huska made 25 saves for his first professional win Saturday night at the Adirondack Bank Center, as the Hartford Wolf Pack defeated the Utica Comets, 5-3. Ville Meskanen had the game-winning goal and an assist, and Sean Day had two assists. Jesse Graham had a goal and an assist for the Comets. The Comets outshot the Wolf Pack 11-5 in the first period, but the teams came out of the first 20 minutes tied at one. Both clubs scored on a Comet power play, after Brandon Crawley was assessed a major penalty for checking from behind and a game misconduct for a hit on Lukas Jasek at 9:54. Only five seconds thereafter, at 9:59, Tanner Kero opened the scoring for Utica with his 22nd goal of the season. Cam Darcy passed from the left-wing circle, just past the stick of Hartford defenseman Ryan Lindgren, to Kero in the slot, and he lifted the puck past the stick side of Huska. Bobby Butler evened things up at 12:36, with the Wolf Pack’s 11th shorthanded goal of the season. After a Zack MacEwen pass went off of Jesse Graham’s stick, Butler broke out on a 2-on-1 with Tim Gettinger. Butler kept the puck and wired a shot from the left-wing side, his off wing, past Utica starting netminder Marek Mazanec to his left. “I thought we did a good job,” McCambridge said. “Having to kill the five-minute penalty was tough, but it was nice that it got evened up, and that was a huge goal by Bobby Butler. The Wolf Pack would strike for three goals in the second period, including two in the first 3:35. Shawn St. Amant gave Hartford its first lead of the game at the 1:54 mark. Sent in alone by a pass from the right-wing side by Terrence Wallin, St. Amant beat Mazanec with a shot to the glove side. The Wolf Pack then chased their ex-teammate Mazanec from the game with a power-play goal 1:41 later, at 3:35. Gropp and Day exchanged the puck on the right-wing side, and Gropp moved into the circle before firing a shot into the net, again past Mazanec’s catching glove. Mazanec was replaced at that point by Michael Leighton, and Meskanen put the puck past him at 14:01 to make it a 4-1 Wolf Pack lead. Matt Beleskey passed the puck out of the left-wing corner to Mazanec at the left side of the slot, and his shot to the glove side went off the post and in behind Leighton. Gropp scored his second of the game at 6:14 of the third period to make it 5-1, set up by a beautiful pass from Steven Fogarty. Vinni Lettieri cleared the puck off the glass on the right side, and Fogarty moved into the Utica end and spun near the goal line, threading a feed through two Utica defenders to Gropp at the left side of the goal mouth. The Comets stopped a run of five straight Wolf Pack goals with a marker by Graham at 13:28. He had an initial shot blocked but got the puck back, and snapped a shot from the right point that deflected past Huska. Carter Bancks then cut the margin to two at 16:45, with a shorthanded goal. With Brendan Woods in the box for slashing, Stefan LeBlanc sent a pass to Bancks in the slot, and he lifted a backhander past Huska’s catching glove. Utica could get no closer though, and the Wolf Pack came away with their fifth win in the last seven games, and the third in their last four on the road. The next action for the Wolf Pack is next Saturday night, March 23, the first of back-to-back games in Charlotte, NC against the Checkers. Faceoff is 6:00 PM, and all of the action can be heard live on News Radio 1410 AM, and 100.9 FM, WPOP, and on-line at www.newsradio1410.com and iHeartRadio. Video streaming is available at theahl.com/AHLTV. The Wolf Pack’s next home game is Friday, March 29, also against the Checkers, a 7:15 PM faceoff. As at all Friday-night Wolf Pack home games, fans can enjoy $1 hot dogs, and $2 beers and fountain sodas, through the start of the second period, presented by Nomads Adventure Quest. 1st Period-1, Utica, Kero 22 (Darcy, Graham), 9:59 (PP). 2, Hartford, Butler 8 12:36 (SH). Penalties-Lind Uti (tripping), 1:29; O’Donnell Hfd (fighting), 4:17; Stevenson Uti (fighting), 4:17; Crawley Hfd (major – checking from behind, game misconduct), 9:54; Lind Uti (high-sticking), 13:06. 2nd Period-3, Hartford, St. Amant 2 (Wallin, Day), 1:54. 4, Hartford, Gropp 9 (Day, Meskanen), 3:35 (PP). 5, Hartford, Meskanen 11 (Beleskey), 14:01. Penalties-LeBlanc Uti (high-sticking), 2:18; Beleskey Hfd (delay of game), 6:33; Arseneau Uti (boarding), 10:08. 3rd Period-6, Hartford, Gropp 10 (Fogarty, Lettieri), 6:14. 7, Utica, Graham 4 (Anselmini, Darcy), 13:28. 8, Utica, Bancks 4 (LeBlanc, Gaunce), 16:45 (SH). Penalties-Chase Hfd (roughing), 8:33; LeBlanc Uti (cross-checking, unsportsmanlike conduct), 8:33; Woods Uti (slashing), 16:21; Jasek Uti (interference), 19:09; MacEwen Uti (cross-checking), 19:48. Shots on Goal-Hartford 5-9-6-20. Utica 11-8-9-28. Power Play Opportunities-Hartford 1 / 8; Utica 1 / 3. Goalies-Hartford, Huska 1-1-0 (28 shots-25 saves). Utica, Mazanec 7-11-4 (8 shots-5 saves); Leighton 8-7-1 (12 shots-10 saves). Referees-Mitch Dunning (43), Mathieu Menniti (30). Linesmen-Neil Frederickson (68), Tory Carissimo (54). "Ryan Gropp scores twice, Adam Huska gets first pro win for Hartford", 5 out of 5 based on 1 ratings. I must say I like your write ups on the Wolfpack, David. I believe this is their fifth win in the last eight games in March….maybe had to do with GMs visit before Ranger’s road trip, I dunno. Happy 4 Huska getting first! Would be interested in seeing Day, Gettinger with the big club to close out season sometime.